Want to know more about ORILISSA? Need help understanding your treatment plan? We’ll help you get the information and support you need. And it all starts with signing up. 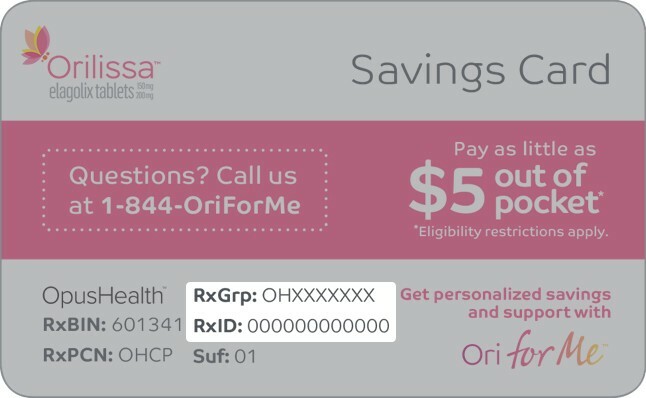 If your doctor has already prescribed ORILISSA, you'll be able to join Ori for Me™, our patient support program. If you’re still researching, we can send more information about ORILISSA and endometriosis. Take a moment to help us get to know you. Join Ori for Me and get personalized resources right at your fingertips with the free Ori for Me app. 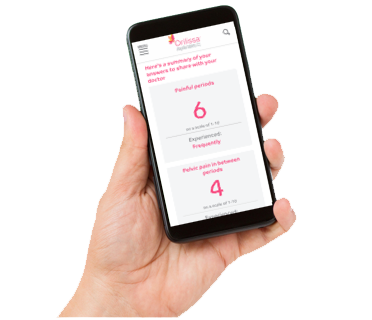 It offers endometriosis pain and wellness tracking, tips and life hacks for women living with endo, and one-on-one support from a nurse. * Even if you don’t yet have an ORILISSA prescription, you can download the free app and get a sneak peek of the full experience. Need to activate your Savings Card? If you already have an ORILISSA Savings Card, it's easy to get it ready to use. Looks like you're new around here. Welcome! Tell us a little about yourself. The more we know about you, the better we can help you get the right resources. Has your doctor already prescribed ORILISSA? Need a copy of your ORILISSA Savings Card? Here you go! You'll receive an email with a link to your card, so keep an eye on your inbox. Has anything changed since your last visit? Let us know if you have an ORILISSA prescription, so we can give you access to more information and resources. Has your doctor prescribed ORILISSA? Looks like you already have a prescription. That's great! We're glad you're interested in learning more — we're here to help. So you already have a prescription? That's great! Have you filled your prescription? Are you experiencing symptoms that may be related to endometriosis? Providing your address will allow us to send you information by mail in the future about ORILISSA. Providing your phone number will allow us to call you in future about support, insurance, and savings. Your phone number will be used only to provide assistance with ORILISSA. Would you like an ORILISSA Savings Card? I already have an ORILISSA Savings Card and need to activate it. What kind of prescription insurance do you have? Your insurance information will be used to determine your eligibility for the ORILISSA Savings Card. Not sure what type of insurance you have? No problem! Call us at 1-844-OriForMe (1-844-674-3676) (1-844-674-3676) and our insurance specialists will help you explore your options. Please enter the RxGrp number found on your savings card. Please enter the RxID number found on your savings card. I authorize my healthcare providers, pharmacies, insurers, and testing laboratories (my “Healthcare Companies”) to disclose information about me, my medical condition, treatment, insurance coverage, and payment related to my use of AbbVie products (“Personal Information”), to AbbVie, its affiliates, collaborators, and agents (collectively “AbbVie”), to provide me with AbbVie-sponsored patient support and for AbbVie’s analytics and research purposes. Personal Information released under this Authorization is subject to re-disclosure by AbbVie and will no longer be protected by HIPAA. My Healthcare Companies may receive remuneration from AbbVie for disclosing my Personal Information to AbbVie and contacting me about my use of AbbVie products and services. I am not required to sign this Authorization and my Healthcare Companies will not condition my treatment, payment, enrollment, or eligibility for benefits on whether I sign this Authorization. This Authorization will expire in 10 years or a shorter period if required by state law, unless I cancel it sooner by calling 800.888.6260, or by writing Ori For Me PO Box 66570 St. Louis, MO 63166. Cancelling my Authorization will not affect uses of my information that occurred before my cancellation was received. I understand that by submitting my information I will receive news and updates about AbbVie and its products, clinical trials, research opportunities, programs and other information that may be of interest to me. Thanks for signing up for Ori for Me! Ori for Me is here to be your guide to ORILISSA. Starting a new medication can prompt a lot of questions – that's why we're here to help you understand your treatment plan right from the start. Now that you’ve joined Ori for Me, you get one-on-one support from a nurse. * This means you’ll speak to the same nurse whenever you call during our live support hours. Nurses are available Monday through Friday 9AM-9PM ET at 1-844-OriForMe (1-844-674-3676) (1-844-674-3676). You can also chat with a nurse in the Ori for Me app! You are also qualified for the ORILISSA Savings Card and it is now ready to use. Download below or check your email for your savings card. Then, make sure that your pharmacy has both your ORILISSA prescription and your savings card information. Ori for Me is here to be your guide to ORILISSA. Starting a new medication can prompt a lot of questions – that's why we're here to help you understand your treatment plan right from the start. Now that you’ve joined Ori for Me, you get one-on-one support from a nurse. * This means you’ll speak to the same nurse whenever you call during our live support hours. Nurses are available Monday through Friday 9AM-9PM ET at 1-844-OriForMe(1-844-674-3676) (1-844-674-3676). You can also chat with a nurse in the Ori for Me app! Information about endometriosis and ORILISSA is already on its way to your inbox. Do you know someone who has endometriosis? Tell her about the Ori for Me™ app! She'll get access to wellness tracking, tips and life hacks for women living with endometriosis, and information about ORILISSA. Do you know someone struggling with endometriosis pain? Talking about this kind of pain isn't always easy. Share a guide she can personalize before her next doctor's appointment to get the conversation started. Would you like to see if you qualify for an ORILISSA Savings Card? Information about endometriosis and ORILISSA is already on the way to your inbox. If you’re experiencing endometriosis pain, it’s time to make an appointment with a gynecologist. Need help getting the conversation started? Create a personalized guide before your next doctor’s appointment. If you get a prescription in the future, be sure to come back and update your information. In the meantime, feel free to keep exploring our site. Ori for Me is here to be your guide to ORILISSA. Starting a new medication can prompt a lot of questions—that’s why we’re here to help. Considering ORILISSA? 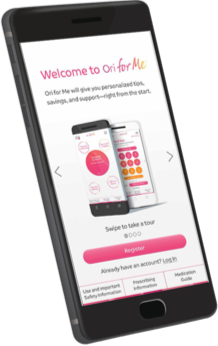 Check out the Ori for Me™ app to get wellness tracking, tips and life hacks for women with endometriosis, and information about ORILISSA. Your card has been activated. Download your card here or check your email for your savings card. Then, make sure that your pharmacy has both your ORILISSA prescription and your savings card information. You're all signed up, but your card wasn't activated. We’re sorry for the inconvenience. Please try activating your card again using the link below. Welcome to Ori for Me! Ori for Me is here to be your guide to ORILISSA right from the start. Do you have questions about your new prescription? Now that you’ve joined Ori for Me, you get one-on-one support from a nurse* so you can get answers to your questions about ORILISSA right away. And when you call during our live support hours, you’ll speak to the same nurse every time you call. Nurses are available Monday through Friday 9AM-9PM ET at 1-844-OriForMe (1-844-674-3676) (1-844-674-3676). You can also chat with a nurse in the Ori for Me app! You are also qualified for the ORILISSA Savings Card and its now ready to use. See what you can get when you download the Ori for Me app. Ori for Me is here to be your guide to ORILISSA. No matter your situation, we’re here to help you figure it out. Have you recently had trouble filling your ORILISSA prescription? Just give us a call at 1-844-OriForMe (1-844-674-3676) (1-844-674-3676). Even if you haven't filled your prescription, there's more to explore on the Ori for Me app. Information about ORILISSA and endometriosis is already on its way to your inbox. If you think ORILISSA may be right for you, it’s time to talk to your doctor. Create a personalized guide for your next doctor’s appointment.